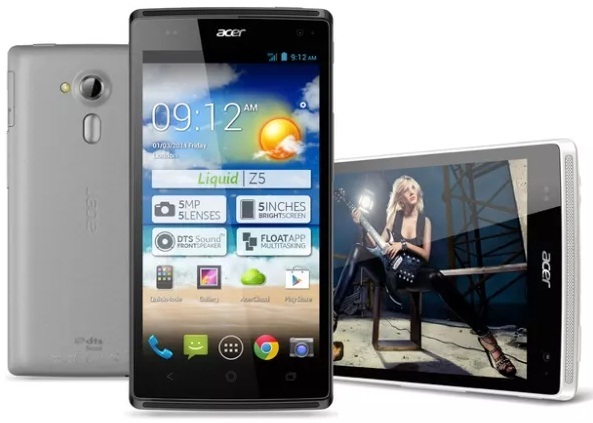 Acer Technologies announces Liquid Z5 5-inch flagship phablet. Check Acer Liquid Z5 review & full details. After its 3.5 incher Z3 that was the launch of 2013 for Acer, the Taiwanese smartphone maker has now upped its own ante and come out with a sleek 5-inch smartphone that goes big-screened and feature savvy in a budget-friendly range. The Acer Liquid Z5 has been infused with features like DTS sound technology, 5-megapixel rear and 0.3 megapixel front cameras, a dual SIM and dual standby support- all yours for 169 Euros! The release comes teamed by the launch of Acer tablets in its ‘Iconia’ series. The smartphone will find its way into several important European markets in mid-January and soon on other locations as well. Apart from a host of glitzy specifications like the impressive 1.3 GHz MediaTek processor that has dual-core capacity and 512 MB RAM, the Liquid Z5 is a definite improvement of the software package that was provided by Acer in its predecessor. So you can enjoy many software tweaks like one-hand control, float user interface and quick-mode profile. The phone is available in two colors- ‘Essential white’, ‘Gentle grey’. You can pick it from markets in France, Benelux, UK, Portugal, Germany, Ukraine and Spain. Lets take a shortcut view of its specifications. Protection cases and flip covers for this new launch are being separately offered by Acer shortly.